Everything about the lines and colors of this building looks dignified, if perhaps predictable. 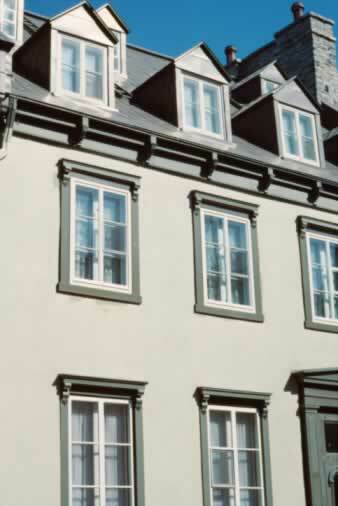 Yes, there are subtle and tasteful adornments - the classical front entry door frame, the small corbels under the roof eaves and window frame tops, and the wooden muntins that break the windows into six or four panes. The dormers' gabled roofs echo the triangular motif over the front door. The color scheme of the building is a light gray-green with darker gray-green trim, and the roof is a functional, weather-wise metal - no surprise there. But if you stood in front of the building and looked up, you might murmur, "Oh, you devil!" Almost hidden in the shade of the windows' shelf-like headers is���the color red. Blow up the image - you'll see, on the second story. Deliciously understated, that red lining adds a royal touch as well as a meeting with the mind of the architect. Good job!